Section 51.207 of the Texas Education Code allows the University of Texas at Dallas to restrict parking on our campus to only those vehicles with a parking permit or pass from the University, and to issue citations to vehicles that do not display a current permit or pass. It also requires UT Dallas to enforce Texas vehicle inspection laws. * Yearly parking permits are valid from the date of purchase to the end of August 2019. ** For the guest of a department. The department itself will be charged $1/hour through their UTD their cost center. Gold and Green parking; plus Orange parking after 5:00 p.m. 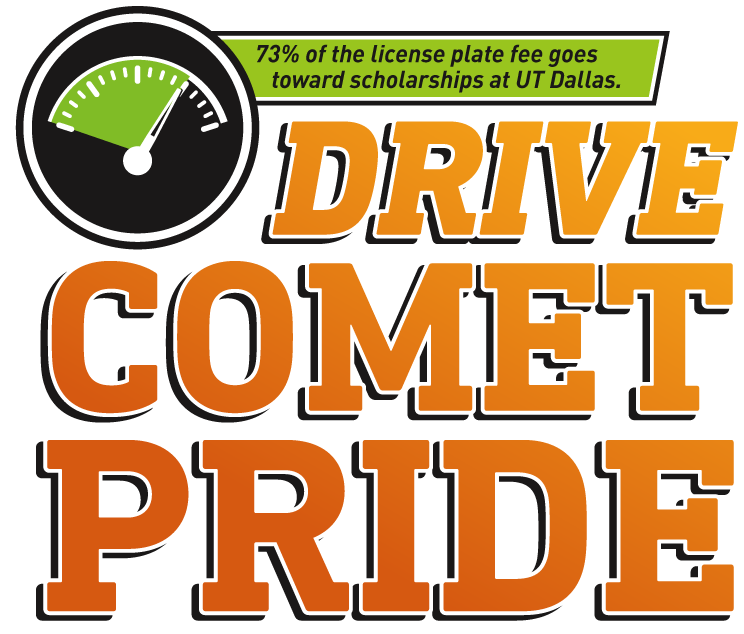 Parking permits are available to all current UT Dallas students, faculty, and staff. You can buy a permit in-person from the Parking Office (PS3 1.200) or you can buy your permit online and have it mailed directly to you. If you buy online, please print out your receipt and use it as a temporary 30-day parking pass. Parking permits not received within 30 days from the date of purchase must be reported to the Parking Office within the first two weeks following the 30th day from the date of purchase to qualify for a complimentary replacement. Lost permits reported after the two weeks following the 30th day from the date of purchase will not qualify for a complimentary replacement, and you will be required to purchase a new parking permit at the current rate. Students can purchase Orange, Evening Orange, Gold, or Green parking permits. On-campus residents are required to purchase their respective housing permit if they will have a vehicle on campus. Housing students are allowed to purchase an additional Orange or Gold permit for parking in commuter spaces on campus, but they cannot park overnight on campus with their commuter permit. On-campus residents are only allowed to park one vehicle on campus at any given time, even if they have purchased two permits. Faculty and staff can purchase Purple, Orange, Evening Orange, Gold, or Green parking permits. Handicap parking permits are also available (see below). Please note, the Parking Office accepts credit cards but not cash nor checks at this time. A permit can be purchased as soon as a customer has access to their Parking Account. Customers are allowed a short period of time, from the first day of class until Census Day, to park without a permit in certain areas, and they will not be cited. This period only applies to the Fall and Spring semesters. The Summer semester requires a permit at all times. For those who have not yet purchased a permit by the start of the Spring or Fall semester, parking is restricted to specific areas. Commuter students, faculty, and staff may park in Green parking without a permit from the first day of class until Census Day. On campus residents may park in their respective housing lot without a permit from the scheduled University Housing move-in dates until Census Day. All other parking areas will be enforced. You must purchase a parking permit before the Spring or Fall Census Day to avoid citations. A parking permit is required at all times during the Summer semesters. Your parking permit is registered to you, but you can transfer it among any vehicles that you own. If your permit is lost, you will need to buy a new one at the current cost; If your permit is stolen, we will replace it once we get a copy of your sworn police statement regarding the theft. If you are a student and you return your parking permit on or before Fall or Spring Census Day, you are eligible for a prorated refund. If you are a faculty-staff member, you may inquire about your eligibility for a prorated refund when you exit UT Dallas. When you purchase a Purple, Orange, Evening Orange, Gold, or Green parking permit for your car, you can request one additional free Open-Air Vehicle or Motorcycle permit of the same type. You can upgrade your parking permit by turning in your permit in person to the Parking Office (PS3 1.200) and paying the price difference between the one you are returning and the upgraded permit that you want to buy. Students who move between University Village Apartments, Canyon Creek Heights Apartments, or University Commons Residence Halls must exchange their current parking permit for the permit that’s appropriate to their new residence; this exchange is free of charge. Parking permits may not be purchased, transferred, or obtained from any source or party other than the UT Dallas Parking and Transportation Office. Displaying a parking permit that belongs to another customer is strictly prohibited and may lead to vehicle immobilization and additional fees and penalties. If you own a current parking permit for UT Arlington or UT Southwestern Medical Center students, faculty, or staff, please bring in your receipt for that permit to the Parking Office (PS3 1.200) and we’ll give you a permit that will allow you to park in Green parking spaces. Cars: Lower corner of the driver’s side of the windshield. Open-Air Vehicles: Back of the center rearview mirror. Motorcycles: Upper right front fork. To be properly displayed, you must remove the protective plastic film from the face of the permit and adhere the permit directly to the inside of your windshield. Grass and all other areas where parking is prohibited. Parking regulations are enforced Monday-Thursday 9:00 a.m. - 9:00 p.m., and Friday from 9:00 a.m. - 5:00 p.m., for Green, University Village Apartments, Canyon Creek Heights Apartments, and University Commons Residence Halls parking. Violating parking regulations, including having a suspended or expired parking permit, may result in a citation. Sorry, but no overnight campus parking is allowed without prior authorization from both Parking & Transportation and the University Police Department. 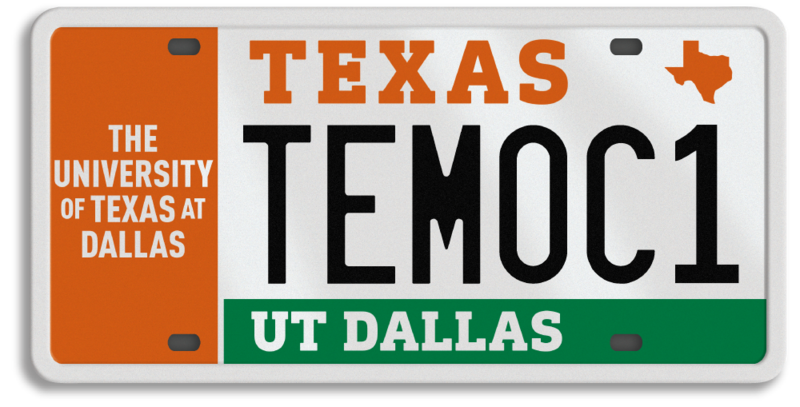 If you use a hangtag/placard, please present a copy of TxDMV [Texas Department of Motor Vehicles] Form VTR-214 (PDF [Portable Document Format File] ) in-person or via email if you purchase your permit online. This is the same form you would have filed with the County Tax Assessor-Collector. If you use a license plate, including a special one such as a Disabled Veterans plate or a Purple Heart plate, please present a copy of the tax receipt for your plate in-person or via email if you purchase your permit online. If handicap spaces are not available, anyone with a Disabled Veterans plate, a Purple Heart plate, or a state-issued handicap plate/hangtag/placard, who is registered with the University (permit or visitor pass), may park in any available non-reserved parking space or metered parking space at no additional cost. Swipe your credit card or debit card through the kiosk. Enter a Department Coupon Code. 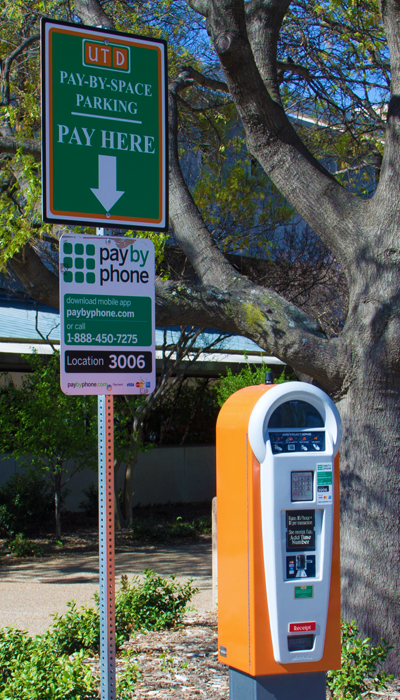 If you already have an account with the PayByPhone service, you can pay through their web site; through their Android™, BlackBerry™, or iPhone® app; or by calling 888.450.7275. Their normal services fees will apply. Please remember to keep your receipt; It shows the time when your meter expires. If your time has not yet expired, and you paid via credit/debit card or Department Coupon Code, you can return to the kiosk and add more time. If you used PayByPhone, you can add more time remotely, and even set up the service to send you an SMS [Short Message Service] five minutes before your time expires. A new code every month, which expires at the end of each month. A code just for a special event, which lasts only for the duration of the event, or only for a limited number of transactions. Once a month, we’ll send you a report of how often your code was used, and charge your department. Charges go directly to your cost center. If you are a visitor to our campus, you can get a one-day parking pass from the Visitor Center or the Parking Office when you bring in a photo ID. This type of pass is only good for the day that it’s been issued, will be issued to you no more than twice in the same week, and will allow you to park only in Green or Visitor parking spaces. For more frequent visits, please take advantage of our convenient Pay-by-Space parking, or contact the Parking Office for the latest prices on weekly parking passes. If you are a faculty or staff member and you need to arrange parking for a guest visiting the campus, permits can also be requested online in advance and emailed to you as a PDF [Portable Document Format File] document that you may email to your guest to be printed. To request an emailed permit, complete a permit request form online two business days in advance of the guest arrival. If you are visiting as the guest of a student residing in the University Village Apartments, University Commons Residence Halls, or the Canyon Creek Heights Apartments, you can request a parking pass from the Visitor Center or the Parking Office. A Driver’s License is required to process your request. Permits can also be requested in advance by on-campus residents and emailed to guests as a PDF [Portable Document Format File] document that can be printed in advance of their visit. To request an emailed permit, the housing student will need to complete a permit request form online two business days in advance of their guest’s arrival. The Visitor Center permits and online permits can only be issued as one-day parking passes, while the Parking Office can issue both one-day and multi-day passes. One-day passes are only good for the day that they are issued and are limited to no more than two free passes in the same week by the same guest. For more frequent or longer visits, please contact the Parking Office for the latest prices on weekly parking passes. Please note that a visitor permit for the main campus is not required for any of the three University Housing areas or for Green parking areas outside of enforcement hours. Monday-Thursday from 9:00 a.m. - 9:00 p.m.
Friday from 9:00 a.m. - 5:00 p.m. These spaces have signage reserving these spaces for electric vehicles only. Non-electric vehicles are subject to immediate vehicle immobilization or towing. To utilize electric vehicle parking, your vehicle must be charging. There is no cost to charge your vehicle, but you must abide by parking rules and regulations by either paying the LUKE parking meter if in a metered space, or utilizing a Gold or higher-level parking permit. Visitor permits are also eligible in electric vehicle spaces in lieu of a Gold or higher permit. To ensure that all electric vehicle owners have the opportunity to utilize this service, there is a 4-hour maximum time limit for charging and parking in reserved electric vehicle spaces. You can pay citations online, or in-person at the Parking Office (PS3 1.200). Please note, the Parking Office accepts credit cards but not cash nor checks at this time. If you receive a citation, you will have 14 days to pay it. After 14 days, a $10 penalty will be added, and another $10 penalty will be added every month until it gets paid. Students with unpaid citations will not be able to register for classes and their grade records will not be released. Faculty and staff with unpaid citations will have their records marked, will have their parking permit revoked, and any renumerations owed them when they separate from the University will be blocked. Appeals can only be accepted through the online appeal portal through MyParking. Please have your citation or vehicle information available. Appeals must be filed within 14 calendar days from the date of citation issuance. After 14 days you forfeit your ability to appeal. If your appeal is rejected, your will then have 14 days to pay it. In order to ensure safe and orderly parking on campus, and to protect the parking privileges of those who abide by the University’s parking policies, Parking and Transportation Services is expanding its parking enforcement to include vehicle impoundment (booting and/or towing). Vehicles parked on UT Dallas property may be impounded without prior notice at the owner’s expense for any of the reasons outlined below. Vehicle Impoundment Process: Vehicles meeting any of the above vehicle impoundment guidelines may be booted or towed at the owner’s expense. The University of Texas at Dallas is not responsible for any damage to a vehicle during impoundment, relocation, or storage. Booting: The owner or driver of a booted vehicle may recover the vehicle after paying a $75.00 booting fee. The booting fee can be paid at the Parking Office during regular business hours, or any time through the online parking portal. Students, faculty and staff may log into the parking portal by using their UTD NetID and password. Non-affiliates may log into the parking portal by creating a guest account. The owner or driver of a booted vehicle may have the boot released after paying the $75.00 booting fee and bringing a valid driver’s license to the Parking Office. If the Parking Office is closed, the owner or driver can also bring their driver’s license to the campus Police Department to have their boot released. The owner or driver of a booted vehicle has 24 hours from the time the vehicle is booted to pay the booting fee and claim a booted vehicle. Booted vehicles will be towed off campus at the owner’s expense if the booting fee is not paid and the vehicle claimed within 24 hours from the time the vehicle is booted. Booted vehicles are not allowed to park on UT Dallas property (this includes metered parking areas) after the boot is released until all citations are paid, or a payment plan is established with Parking and Transportation Services. Previously booted vehicles are subject to towing if parked on UT Dallas property without paying all outstanding citations, or if the owner or driver defaults on a previously established payment plan or does not make payments on time. Towing: A vehicle’s owner may recover an impounded vehicle after paying all impound fees due. For additional information about impound fees and documentation needed to recover an impounded vehicle, please contact Signature Towing (972.423.4010 / www.signaturetowing.com). Suspension of Parking Privileges: Immobilized or impounded vehicles are not allowed to park on UT Dallas property (this includes metered parking areas) until all outstanding citations have been paid, or a payment plan has been established. Failure to comply may result in additional vehicle immobilization or impoundment at the vehicle owner’s expense. UT Dallas Parking and Transportation Services does not manage Northside. All parking inquiries regarding this property should be directed to the Northside Leasing Offices.